The Am2903 Test Board is intended to test the working condition of the AMD Am2903 and its many compatible BSP chips. previously time-consuming operations.. The 2903 also contains a 16×4 bit two-port RAM. In a real application the Am2903 BSP elements execute micro instructions generated by a microprogram controller unit such as the AM2910, based on PROM stored microcode. In this test board a PIC MCU is used instead of a microcode PROM and microprogram controller. The PIC MCU’s test program provides register and function tests of AM2903 BSP and test routines with LED animations. It also supports 4 push buttons as inputs, and 8 LEDs as output devices. 48-pin ZIF Socket: For one Am2903 BSP to be tested. PIC MCU: Microcode controller to generate micro instruction of test code. 4 Push Buttons: Input devices. 4 bit data latches and bus drivers of each data and address ports. The board requires a single +5V power supply (400mA) provided through a mini-USB connector. There is a power switch and power indicator LED in the lower-right corner of the test board. Since the AM2903 is an improved version of the AM2901 the board (via an expansion) also can support testing of the AM2901. 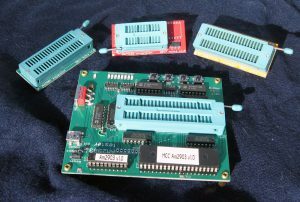 The AM2901 is the most widely used 4-bit slicer ever made, having been produced for over 20 years, and used to implement a host of processors. With the AM2901 Expansion the board can test both original Bipolar 2901s and newer CMOS ones. 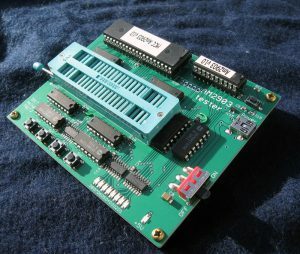 The 74181 is a basic 4-bit TTL ALU capable of basic 4-bit math and logic functions that originally came out in about 1970 and was made well into the 1990’s. Like the 2901 it formed the basis of many processor implementations. It is a standard 7400 series medium-scale integration (MSI) TTL integrated circuit, containing the equivalent of 75 logic gates and most commonly packaged as a 24-pin DIP. The 4-bit wide ALU can perform all the traditional ADD/SUB and decrement operations with or without carry, as well as AND, NAND, OR, NOR, XOR and shift. The 74181 performs these operations on two four-bit operands generating a four-bit result with carry in 22 nanoseconds (45 MHz). The ‘181 was made in military spec (54181) as well as several other TTL varieties such as Schottky (74S181), Low Power Schottky (74LS181) Fast (74F181) and High speed CMOS (HC and HCT). The 74181 Expansion supports all these versions. A complete system with 2901, 6701 and 74181 expansions is available for $149.95.